I can think back to before I was pregnant with Thom. Everyone around me (including strangers on the streets) lovingly offered at least a couple pieces of advice for motherhood. One consistent piece of advice given was to have a solid support system in place, to go find your mom tribe. I reflected on this piece of advice, and decided when the time came (after Thom was born), I would go out there and find my group of mom friends. Never did I think it would be so challenging yet so critical. Growing up, my circle of friends was small. I was an only child, and often hung out with mostly guys. I wouldn’t go as far to say that I was one of the guys, but I also did not have an extensive network of girlfriends. A couple of very close girlfriends helped me navigate my childhood, high school, and college. I am also what they call an extroverted introvert. I can be very social in certain situations but I tire easily from social interaction and need me time. For me, meeting new people meant stepping out of my comfort zone. Before Thom was born, my husband and I lived in a tiny 5th floor walk-up studio apartment in the Upper East Side. We lived steps away from our favorite park, our favorite restaurants to order from, our dry cleaner, our favorite diner, our corner bodega, with a Whole Foods just a few blocks away. It had been home for more than 3 years. As Thom’s due date crept closer and closer, we had to decide on a plan. We needed more space, a dishwasher, laundry washer and dryer, and to get out of the 5th floor walk-up. My nesting instinct was kicking in and I was anxious to get out of that apartment, to get out of the city. By the beginning of October, we were completely moved out and settled into a townhouse in Hanover, New Jersey. Leading up to Thom’s birth, I was too deep in nesting mode to even miss living in the city. I wanted to create the perfect space for my newborn before he got here. Fast forward to after Thom was born—I was surrounded by family (my in-laws and my parents spent Thanksgiving with us) for a couple of weeks. Those first few weeks were an absolute blur. Everything happened so quickly, suddenly I was a mom and suddenly I was the sole food source for this tiny being. Amid all the sweet baby snuggles, there were a lot of sleepless nights, a lot of emotions, and a lot of breastfeeding struggles. His latch wasn’t right. It was painful. Every nursing session was high strung stress with him crying and flailing his arms about and me feeling unsure, frustrated, and alone. 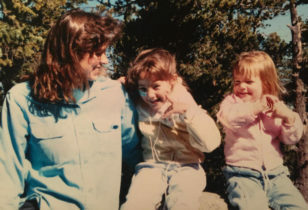 I reached out to my family and friends (sisters-in-law, childhood friends, college friends, past coworker friends), who were also nursing mamas and asked about their experiences. Everyone had slightly different experiences, but encouraged me to stick with it. One sweet friend’s words kept me going—“It will get better, I promise you.” I clung onto those words for dear life because I honestly didn’t know how much longer I could do this for. Though most of my mom friends live either a long car ride or flight away, the support and encouragement that I received from my small network was more than essential in this instance. I was reminded of the importance of having a group of mom friends locally. I tried to put myself out there. I started to attend a local breastfeeding support group, which was immensely helpful in my breastfeeding journey. While attending this group, I no longer felt as alone as I did before, but for some reason I still could not connect with other mothers. This had me questioning myself. What was keeping me from making friends? Was it the sleep deprivation? Or had I stepped so far out of my comfort zone with all the life changes that I didn’t have enough energy to make new friends? Or was it the anxiety of trying to keep this little human alive, happy, and well-fed getting in the way of making friends? Did I forget how to make friends? Why did it feel so forced to reach out to other new moms? It took me back to that feeling of being single and yearning for a relationship, but cringing at the thought of putting myself out there for fear of rejection. Once the breastfeeding issues had resolved, it seemed like a fog had been lifted. I began spending time with a childhood friend who also had a son, but it was difficult to coordinate playdates because our sons are 5 months apart with completely opposite napping schedules. I still felt like my lack of local mom friends was real. It made me feel more lonely and anxious. And I realized how much I missed the city. My mind finally came to the realization that we now lived in the suburbs, that the conveniences and inconveniences of the city were no longer mine. Of course, at the same time, I reveled in those special moments with my little Thom. Kissing his soft chubby cheeks, witnessing his first smile and hearing his little baby giggles for the first time made everything better. It still hasn’t been easy to find my group of mom friends. 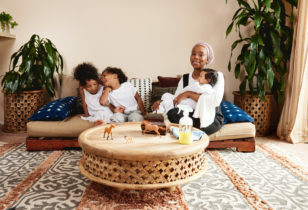 And it has lead me to believe that motherhood—though incredibly rewarding—can be lonely at times, that I might not be the only one experiencing this, and that there are other mothers out there who are still searching for their tribe. It makes me even more appreciative for the mom friends that I do have, even if they live far away. There are a few things I know for sure: Motherhood requires stepping out of your comfort zone. Motherhood is not for the faint of heart. And when mothers support each other, great things happen.